The funny thing about dentists is we are constantly working to put ourselves out of business. You may think that a ridiculous statement, but think about it, we are always trying to tell people how to avoid dental problems (Brush and floss! Avoid sugar! Get you teeth professionally cleaned every 6 months!) And of course, if people avoided needing dental work, well, we would need a lot less dentists around. Cavities – caused by poor oral hygiene and/or excessive consumption of sugar. Gum Disease – caused by not brushing and flossing and not having regular professional dental cleanings to remove tartar. Trauma – caused by injury from sports, accidents, etc. While there are numerous different types of conditions that dentists’ treat, most problems start from one of the three things listed above and escalate into bigger problems. And bigger problems equal bigger dental bills. Tip 1: Keep up with dental visits. Avoiding the dentist can be a costly mistake. When dental problems are caught early, they are quite affordable to fix. Waiting to fix a cavity can turn a $150 fix into a $2,000 fix. Sometimes people think that if their teeth aren’t hurting, there isn’t a problem. Unfortunately, waiting for a tooth to hurt means expensive treatment will be necessary to fix the problem as opposed to a dentist finding the problem on an x-ray before it’s turned to something major. Tip 2: Eat sugar the smart way. Eating and drinking sugary foods and beverages can lead to cavities. Most dental problems start as a cavity so avoiding cavities can greatly reduce the dental bills one will face in his/her lifetime. While most people won’t stop eating sugar altogether, there are some ways to limit teeth’s exposure to sugar. If you’re a soda drinker, start drinking soda through a straw and try to drink the soda in one short sitting, instead of sipping throughout the day. This way the sugar has less of a chance to get at your teeth and the saliva in your mouth can do its job of breaking down the sugar better if it’s not constantly being bombarded with more sugar every time you sip. Chew Sugar-Free gum or gum with Xylitol. Chewing gum increases your saliva flow and saliva can help “wash away” the sugars that stick to teeth and cause cavities. Xylitol is a type of sugar that can actually ward off cavities. Brush your teeth after drinking soda or eating sticky or sugary foods. While people are aware that soda and candy are bad for their teeth, many are surprised that even crackers or bread can be harmful. Starchy foods have natural sugars in them and when you eat them your saliva breaks down the food into the basic sugar complexes. If you do not brush after eating these starchy or sticky foods, the natural sugars from these foods will sit on your teeth and lead to cavities. Tip 3: Brush and Floss. Brush at least twice a day and floss once a day. Replace your toothbrush every 2-4 months or when the bristles wear down. A worn toothbrush is not nearly as effective as a new one. If you haven’t been successful in preventing dental problems, you can still save money at the dentist by following the last three tips. Tip 4: Saving time equals saving money. 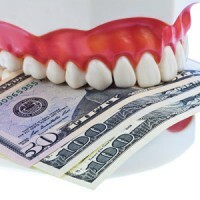 Multiple visits to the dentist can cost you additional money beyond the fee for the treatment. You may loose out on pay for taking time off work, or need to hire a babysitter to watch your kids during your appointments. If you’re facing more extensive dental treatment consider finding a dentist who can complete the treatment in one visit, thus saving you time and money. Several dental procedures that used to require multiple visits, like root canals and crowns, can now be done in one visit with the use of a CEREC machine. In my Cincinnati dental office I am able to use the CEREC CAD/CAM technology to design and mill crowns right in office in one visit. This means patients don’t have to wait for a lab made crown and it means that I can place a crown immediately following a root canal. Tip 5: Look for a dentist who can complete your entire treatment in one location. Some dentists like to have a specialist perform some of the treatment needed, while others prefer to handle the entire treatment themselves. By finding a dentist who completes all your treatment in office, you can save quite a bit of money. For example, the average starting cost for dental implants is over $4,000 and typically involves one or two specialists and numerous visits between all the offices to complete. At Total Dentistry, I handle the entire procedure in about 2 visits for a starting cost of $2,500, saving patients thousands. Tip 6: Do your research. By following these six steps, I am confident you can save money on your next trip to the dentist.